Scientists at Tokyo Institute of Technology have theoretically demonstrated that special tetrahedron nanostructures composed of certain metals have a higher degree of symmetry than the geometrical symmetry of spherical atoms. Nanomaterials with unique and unprecedented electrical and magnetic properties arising from this symmetry will be developed and used for next-generation electronic devices. Researchers from Tokyo Institute of Technology, including Prof. Kimihisa Yamamoto, set out to demonstrate the existence of metals with such types of symmetry. The team inferred that special inflated tetrahedron structures made of specific metal atoms, such as zinc and magnesium, may have a special type of symmetry arising not from geometrical properties but from the dynamic characteristics of the system. 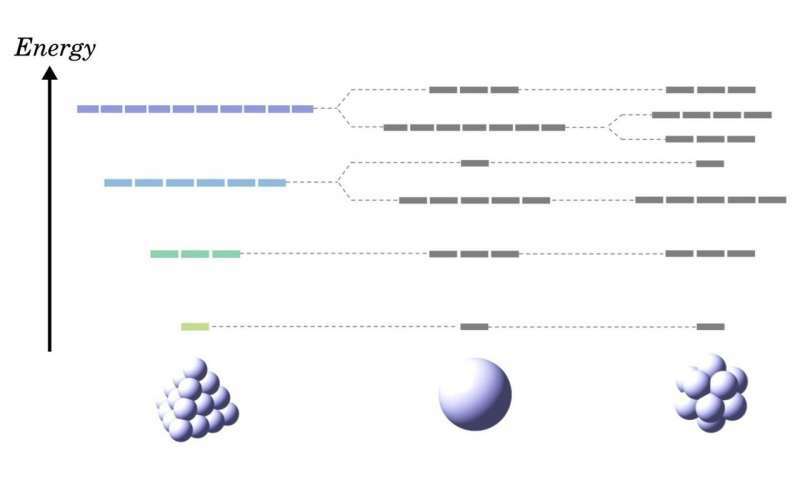 "We have demonstrated that realistic magnesium, zinc, and cadmium clusters having a specific tetrahedral framework possess anomalous higher-fold degeneracies than spherical symmetry," explains Yamamoto.